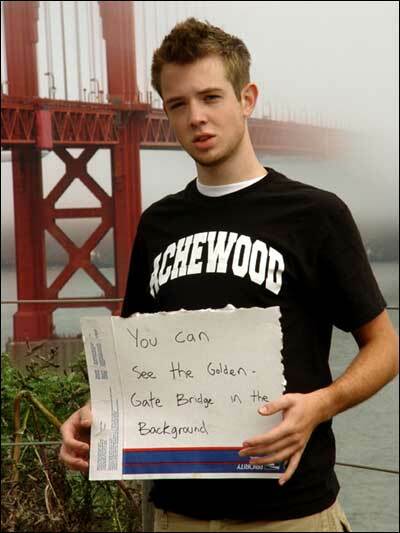 Achewood recently held a contest for its readers to take clever photos of themselves in Achewood duds. We were both blown away and disappointed by the results. We would like to sincerely thank all who took the time to submit photographs. We could never index and display all the images you submitted; here is a sampling of the top stuff. Prize winners will be contacted this week. JUDGE'S COMMENTS: I know Sean, he's a friend of mine. I can't in good conscience let him compete for the advertised prizes; yet I can't in good conscience not give Sean's photo set top honors. Sean, we'll work something out. I have some ideas. 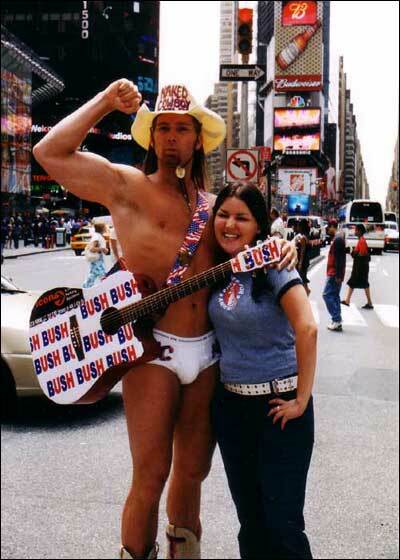 JUDGE'S COMMENTS: The Naked Cowboy is an institution in Times Square, Manhattan. Here Natasha completes his tableau in a snappy Philippe For America gym T, unafraid to challenge the Naked Cowboy's politics. Good show, Natasha. You win a $40 Gift Certificate to the Achewood store, and our admiration. Ian, Nevada City, CA, USA. JUDGE'S COMMENTS: I like a fellow who follows the rules, and who submits a quality photo. In focus, crisp, well-lit, this is podium stuff all the way. Furthermore, unlike the other Golden Gate photo entries, Ian thought to take the additional step of involving a hand-lettered cardboard sign, a highly appropriate crib from the San Francisco socioeconomic landscape. Ian, do you care to claim your $20 Gift Certificate. You deserve it. Ian sports the Achewood Varsity design, a shirt not currently in production. 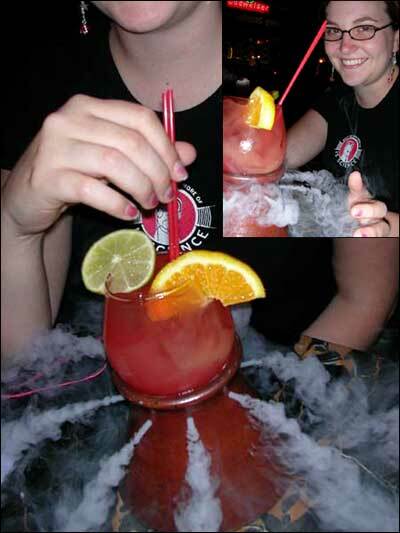 JUDGE'S COMMENTS: Dana tells us this drink is called a "Borneo Fogcutter." I would like to thank Dana on behalf of all my readers for expanding our common notions of just what a beverage garnish can be, if it sets out for gold. Dana, a $10 gift certificate to the Achewood store cannot begin to cover the cost of this drink. Dana sports the What We Need More of is Science Women's T.
JUDGE'S COMMENTS: Now this took some doing. 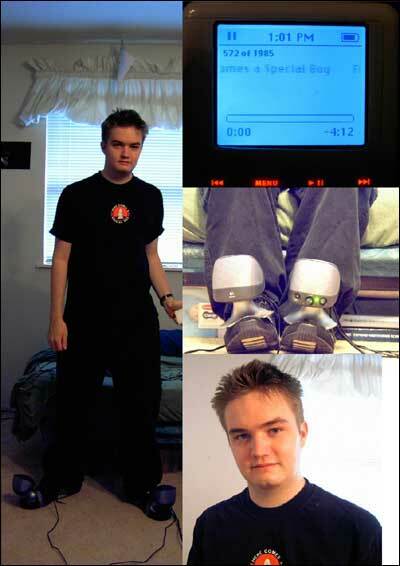 Miles has photographed himself recreating Philippe's "Speaker Sneakers." He has even downloaded and cued up the Here Comes a Special Boy song to play over them. This is a good indicator of what a clever boy can do if left alone most of the day. Miles we are going to give you ten dollars. Miles sports the Here Comes a Special Boy T.